I've got 24 more to go, 9 of those are just the same images with higher numbers in front so they don't really count. Maybe another day and a half of work. Then it's onto coding the stuff and testing, which I'm looking forward to. !! !I AM FUELED BY TURKEY AND PUMPKIN PIE!!! That's my way of saying Thanksgiving was awesome as usual, good family and good food. Now the toilet will feast on my holiday dumps from now 'til mid January! 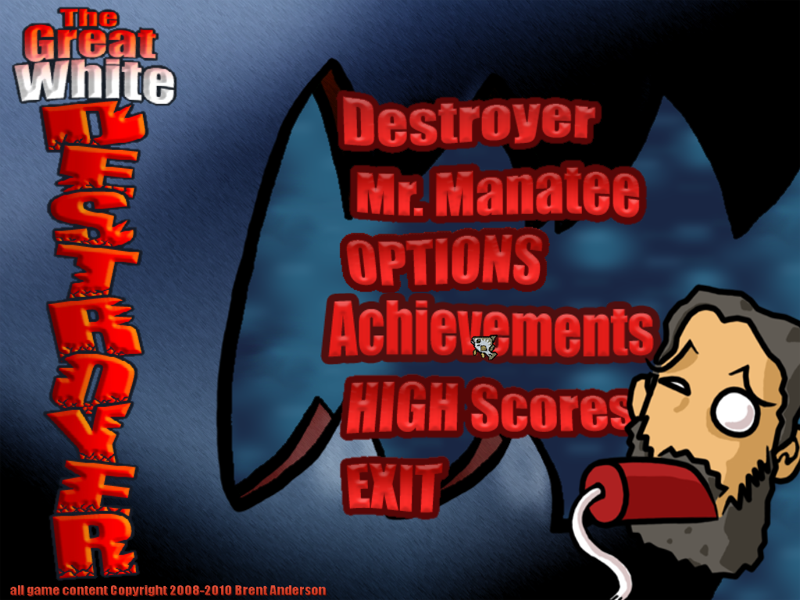 Also, The Great White Destroyer is on sale at GamersGate now, until the first week of January. The discount will vary, right now it's 40% off. ALSO also, if you happen to have some commercial indie games and would like to contribute to a fatass compilation video of commercial indie games, check out Pixel Prospector for the dealio. I have to get in gear and submit some myself. The deadline is Dec. 12th, so get movin'! That's what I've been working on, and will be working on for the next 3 to 4 days most likely. Examples you say? Surely. 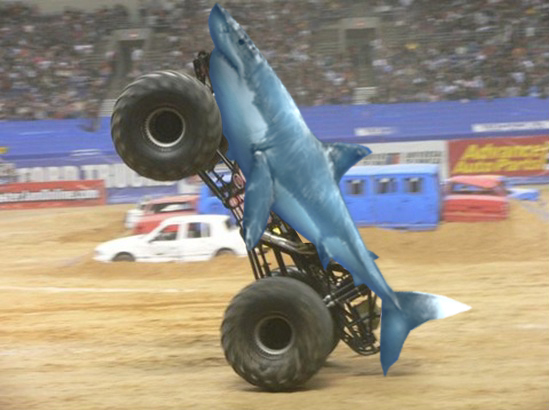 This one is "Sharkburned Again! 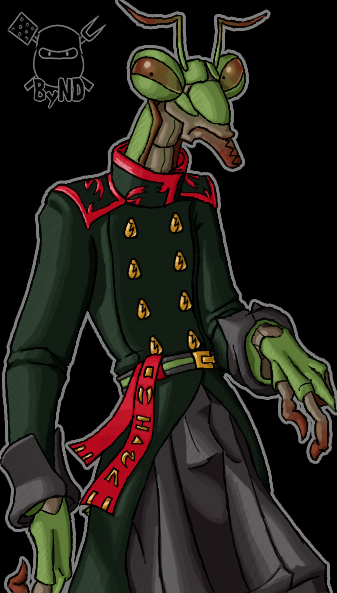 ", you get it for eating the good Admiral. 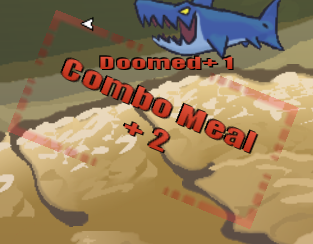 "Faster Food", gotta get a 10x combo meal while non-frenzy. "Feather Sniper", get it with a 3x bird shot combo. "Man Fisher", knock some poor swimmer onto a fishing hook. All the originals are 512x512, but these here are the ingame 64x64 versions. Now, just a few screenshots. 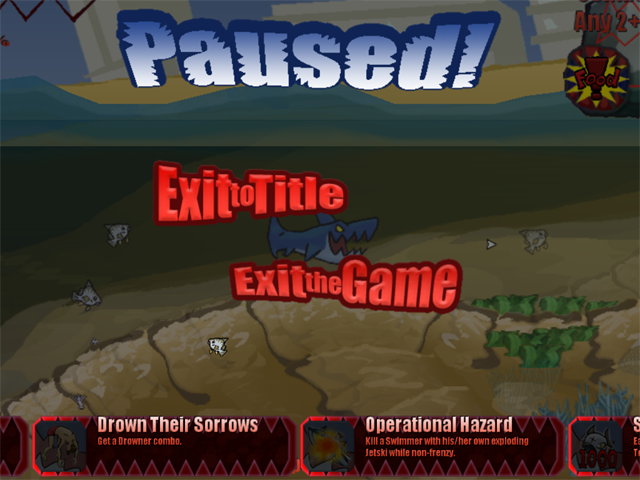 Here's the new addition on the title screen. 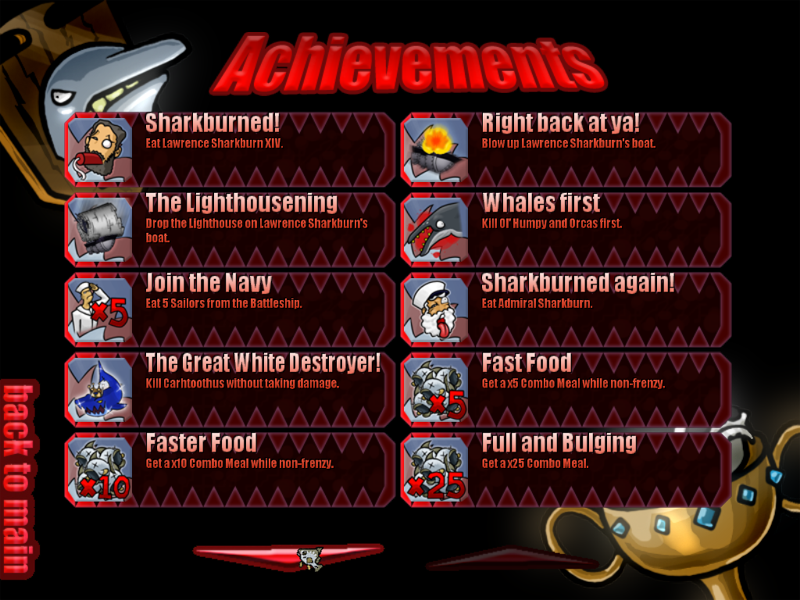 And this is what the actual achievement screen looks like. Right, got The Great White Destroyer sounds sorted out. All the music has been converted to mp3, except for the frenzy tracks, left them wav for fading purposes. I think this led to the game running much smoother in some areas, even when testing in debug mode it's faster than before. The ram needed to run the game has also decreased to around .6gig instead of 1.5gig. Also got the game displaying for 1024x768, by using the view port settings. Everything is still 800x600, it just get's blown up. [EDIT] Forgot to mention that the game loads up in around 30 seconds now, holy cow! It used to be anywhere from 1:30 to 3 for some people. -Right back at ya! 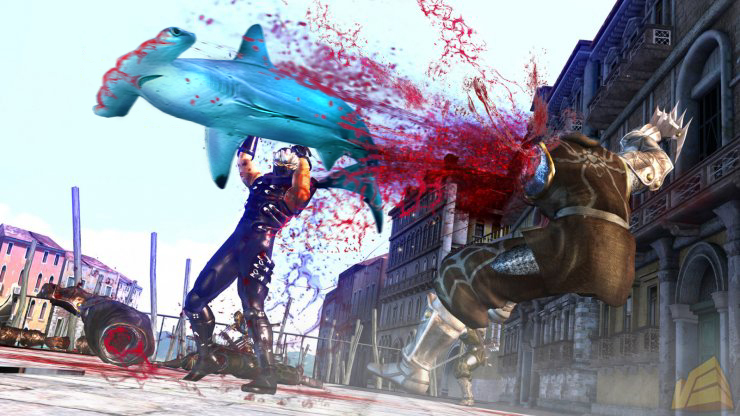 = Destroy L. Sharkburn's boat with his own dynamite. -Manfisher = Knock a swimmer onto a fishing hook. -5Cent Bulletproof? = Get shot by Lil' Snips 5 times before killing Big Snips. Stuff like that, I think there's 72 listed at the moment. 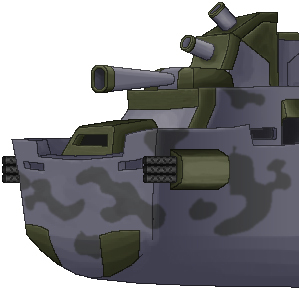 So I have to come up with a place in game to scope these out, make some art, get it coded. That's what's up for next week. 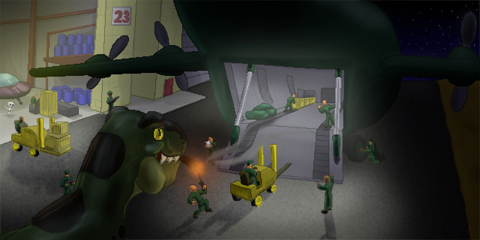 I didn't get all the animations finished this week, had a few busy days. But these three are done. 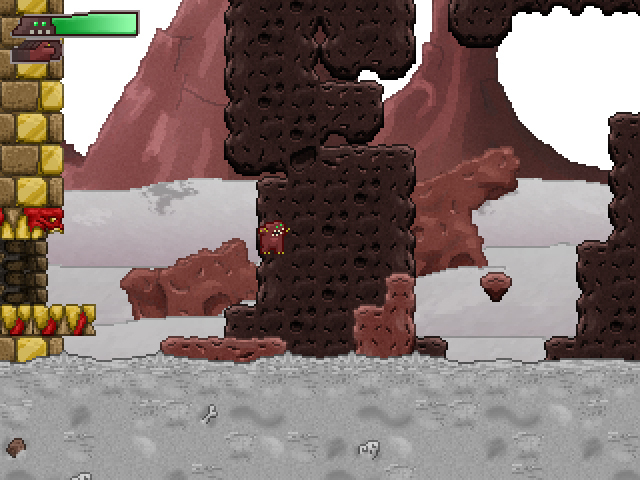 There's a poo scoop, where he flings dung and sometimes oozes at the player. Then there's a shovel swat. Last is his walk cycle, which works well in reverse also, probably due to him being so large and round. YoYoGames released their spec info for developing iPhone/iPad games, so I'll be converting The Great White Destroyer(TGWD) and Snowball's Chance over for those platforms starting next week. For TGWD, I'll be downsampling my sound effects, hopefully without them sounding too bad, to save on file size. Having the music be .MP3s will be a huge help, they're .WAV currently. Also I'll be working on screen size related issues, a control scheme suited to portable touchscreens, achievements, improving performance, all kinds of crap. I'll try to do it in a smart way so there will be a new PC version as well. The same goes for Snowball's Chance, I'll probably add even more stuff too, content wise. Friday Bullcrap is Saturday : Back to the Shaft! Ok, first up is a report on the Trick or Treat sale. There is nothing to report. It still continues until Halloween eve. Back to You Got The Shaft. No video since my work on it this week is all just art, so I'll post it for ya! 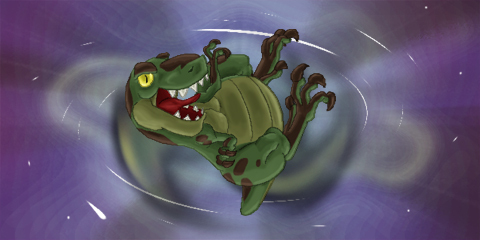 Been working on that mini-boss from the first stage, I have 4 of his animations completed so far. His name is Crapmunch, he eats crap with his shovel. A rundown of those anims. -#1 is a prefight idle, he's chawing on poo. It's a pretty simple squishy animation. -#2 is also prefight, he's shoveling some more stuffs into his mouth. You'll notice his arm stretches out there, anatomy can take a back seat on this one. -#3 is an intro of sorts, he turns to face Monsta when he gets close. 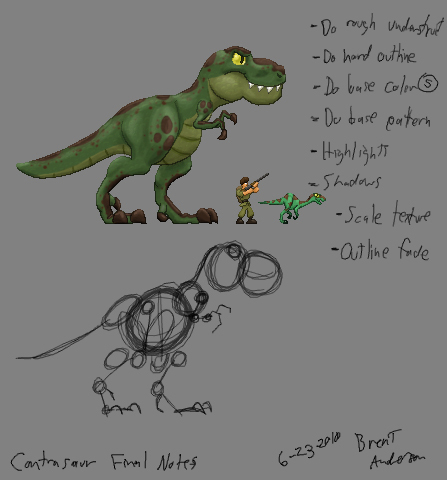 -#4 is a combat idle, I will be a tad slower in game than in that gif. I've got a handfull more to do, hopefully they can be wrapped up this next week sometime. Everyone have a safe Halloween! Let's play a game. 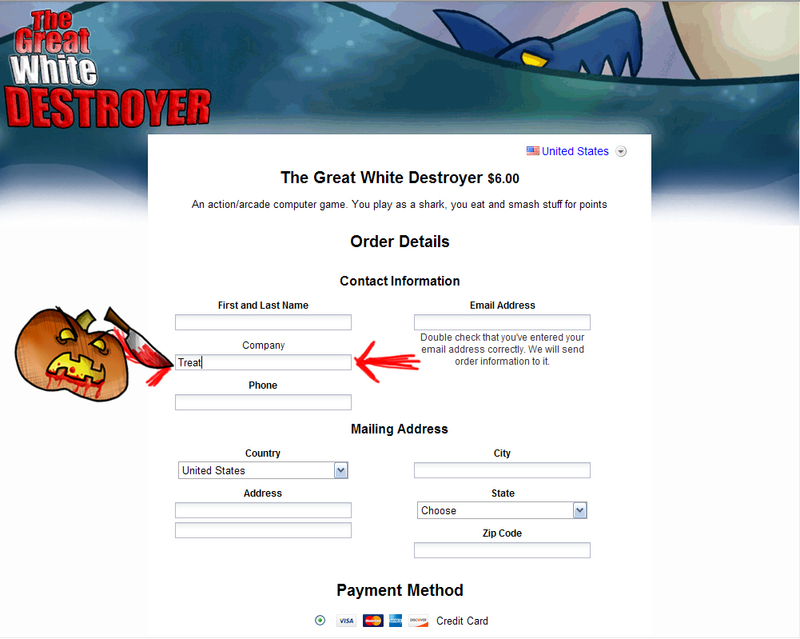 The Great White Destroyer(TGWD) will be on sale all next week, a special sale, one of choices. On Monday, TGWD will be $4. If someone chooses to buy a copy, I want you to look on the order form under where you enter your name, there will be a "Company" field. I'd like you to enter "Trick" or "Treat". At the end of the day, I'll be counting up all the Tricks and all the Treats. You see, a Trick will increase the game's price by $.10, and a Treat will lower the price by $.10. So after it's all added up, we get the new price for the following day. If a purchase is made and the "Company" field is left blank or something off the wall is put there, a coin toss will decide the outcome, heads will count as Trick and tails as Treat. There are limits. The price will never drop below $2 or go higher than $5.90. Will the price go higher or lower? Time will tell. I'll list the results the following day. So there it is, the game is on. A slug and a bug. Working on some characters for this new venture to nail down the art style. Got a couple finished ones here. I'll be hashing out a good handfull more while throwing down crap on paper, then I'll actually start putting some game together. Trying to decide on doing single player first and adapting multi later, or just start multi. Ahhh anyway, characters. 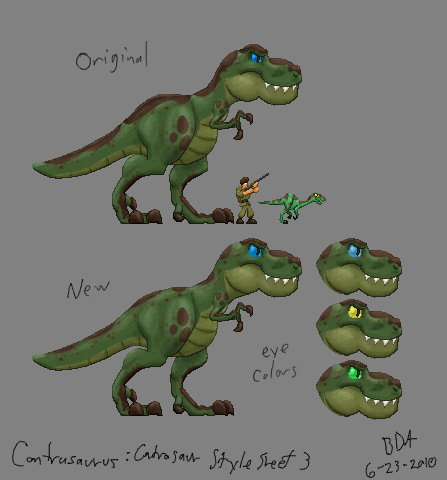 My buds over at STRd6 have finally got Contrasaurus ready for the public consumption. For those of you not in the know, I worked on the pixel art for the game. It's a sidescrolling action romp with a t-rex who gets snatched up from the past, loaded to the brim with explosives and amunition, and thrown into a conspiracy blender! 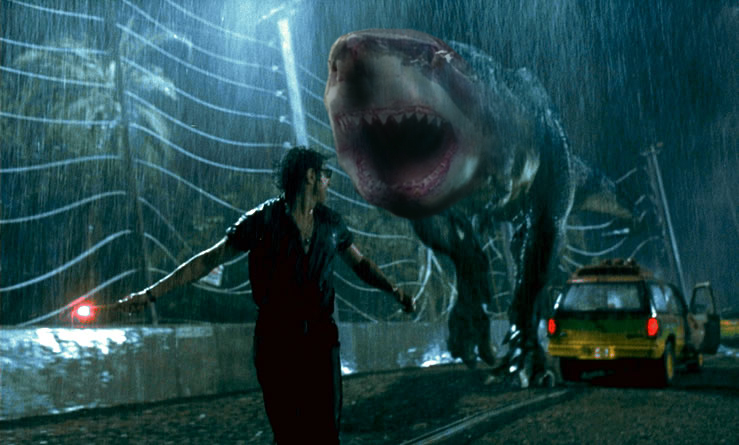 You are the t-rex, YOU ARE THE CONTRASAURUS. 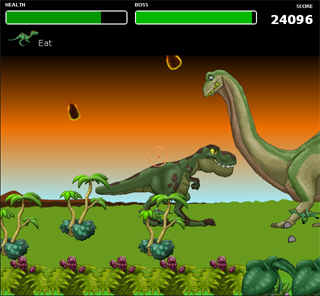 It's all made with HTML5, so if you're going to play, throw IE out the window. You need yourself some Google Chrome, possibly Safari or Opera. Links for the link god! Here's the official STRd6 launch. It's in the Ludum Dare October Challenge! Only because I don't know crap about coding that kind of thing. If I understand it correctly, server code actually runs the game and is purely computational, while client side does all the pretty stuff, and they communicate back and forth. Is that a propper stripped down explanation? I don't know. Anyhow, been roughing out ideas for this next venture, doing research, deciding on how it'll play and look. All that fun stuff. Plus I'm pretty sure I've gained what I can from the Torque2D tutorials, as soon as I have enough down on paper I can get to prototyping. 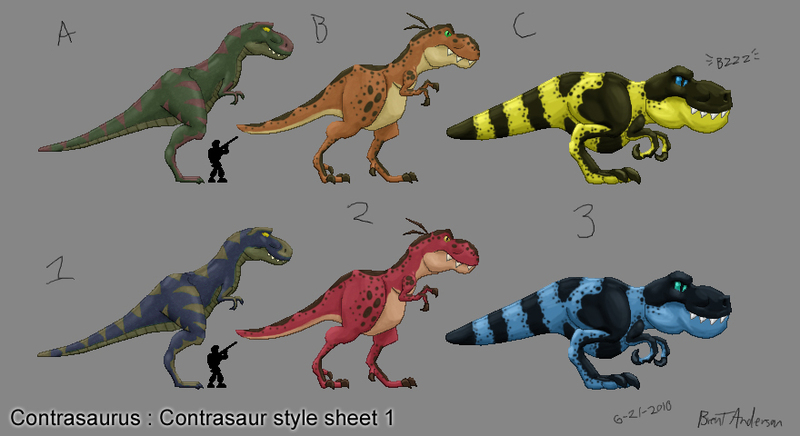 Ok, so Contrasaurus work is wrapped. Finished up with a little Robo-Reagan energy beam attack. No pics, because I don't feel like it. I took the plunge and got me some Torque2D. I've been going through the tutorials and think I'll be just fine. There are some extra steps code wise compared to what I'm used to, but that's ok. I was going to take YGTS and start porting it over, but I don't think so. Frankly that kind of game has been done before, and I've had some genre mixers bouncing around in my head lately, stuff that as far as I know hasn't been done yet. So, I'll begin full steam ahead on that in the next day. 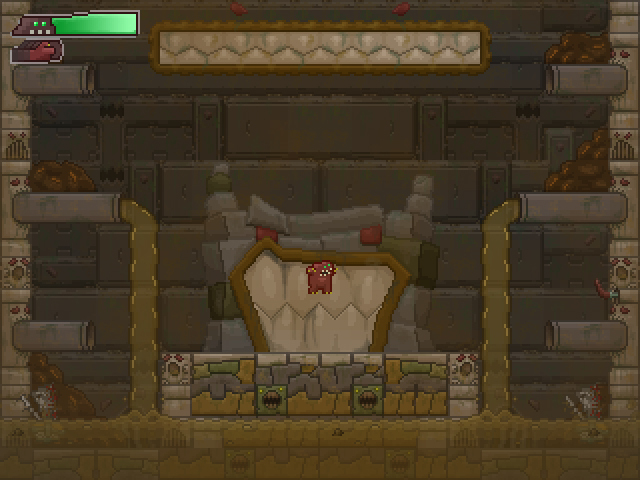 I hate leaving a game on the floor like YGTS, but there really wasn't that much done yet. That was maybe a months worth of work(or less) over a period of 4 or 5 months. It may get revisited down the road, who knows. YoYoGames has plans for Gamemaker regarding the iphone and ipad, which means I might get the Shark on there down the road, maybe even Snowball. That's it for now, I'll be back when I got's stuff.